For those of you looking for an easy way to secure your spot in our upcoming classes we’ve created an Etsy listing that will allow you to register for either the 10:00 am or the 1:00 pm sessions. You can also reserve a spot by using this form and paying by check or credit card on the first day of class. Classes begin February 4th and run 6 weeks ending March 11th. There will be two Saturday sessions, the first from 10:00 am to 12:00 pm and the second from 1:00 pm to 3:00 pm. Please specify which class you are interested in. I began teaching in 1998, a few months after the completion of my bachelors degree. It was an opportunity that was set up by my former professor and mentor Vicky Hansen. That first gig was for the a local senior center here in Pueblo. It was poorly paid and I had to buy supplies from my meager checks, but it was a fantastic place to begin accumulating a solid portfolio of projects for teaching, and the skills to communicate them effectively. I stayed with that job for two years, and it was during that time that I began to understand the fundamental connection between teaching and knowledge. From the perspective of a student this connection is simple and obvious but for the teacher is more subtle. It was through teaching hand building to elderly beginners that my personal identity as a sculptor was born. Learning to observe and identify a students difficulty and then offer a clear route to success, taught me to see my own work more completely, and the excitement and raw creativity of new students has kept my energy and commitment pure. A few years after the SRDA I was offered the position of resident artist at the local arts center. I stayed in that position for eleven years. My years of teaching at the art center continued the learning began at the senior center and refined other skills. From class room management for large groups of kids to the subtle push and pull of helping an artist aim for higher goals, I truly became a teacher of ceramic art. In fact I often feel that I am a better at teaching than anything else I do. After so many years, I was ready for a break. The endless rotation of students in an institution like an art center became exhausting. It was possible for me to teach preschoolers, at risk high schoolers, learning disabled students and artists in the same day, and of the over one thousand students that I might teach in an average year the vast majority would only come once for a single project, meaning that studio rules and basic processes had to be repeated endlessly. Don’t get me wrong, It was a well paid job that I loved, but the enormous energy requirements to deliver effective lessons under those conditions for multiple years was just something that I could no longer sustain. So when I said goodbye to my students and studio at the art center in December, I figured it would be a good long time until I picked up that hat again. Obviously I was wrong. Almost immediately after leaving I started being approached by parents seeking lessons for their kids. i would give out my number, promise that eventually I would resume teaching and forget the encounter. Enough of these piled up, with follow up calls that I felt I had to set a schedule and start up again. The first thing we had to do to begin was to rethink the studio (again). 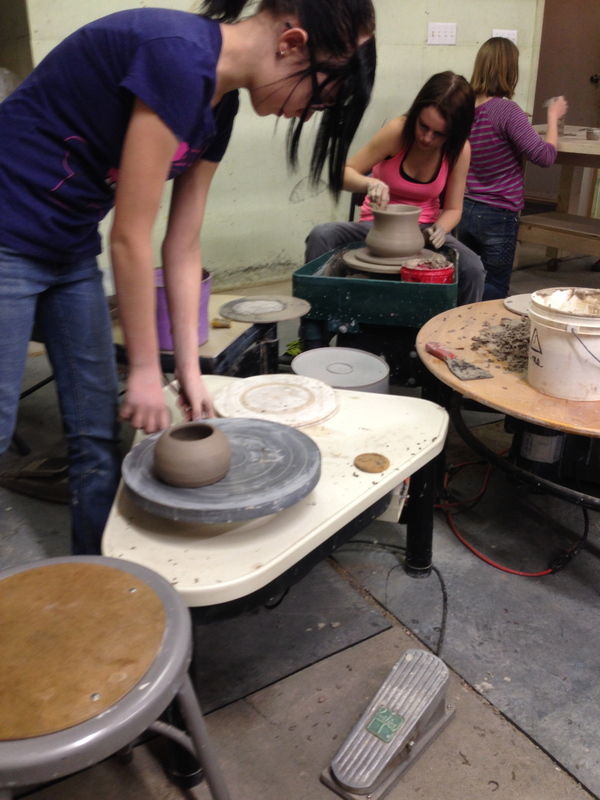 Teaching ceramics requires some room, which is at a premium in the old barn. Of course there were areas that were not maximized for efficiency, so that is where we began. We have four electric wheels that we set in a tight group and a long table very close by for the hand builders to work. The proximity allows me to teach two lessons at once without missing that critical moment before a work fails. This was set up in the area that we had set aside for my step dad to park his car. Fortunatly he’s made other arrangements for the car. Other things had to shift as well, because we wanted the place to be accommodating for students and parents that might not be familiar with the clutter and dust common to pottery studios. I structure the classes in beginner and advanced sections, these groups rotate from table to wheels on the hour in a two hour lesson. The class is full at 11 students, from age 4 to 15. A student needs to 10 years old to start the wheel so younger students concentrate on hand building and the older tend to gravitate to the wheel. 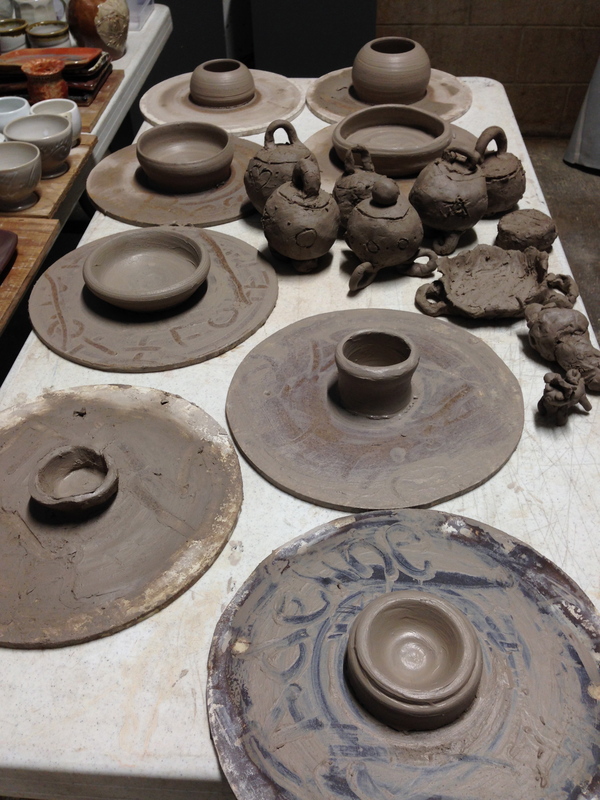 For our first lesson the beginner hand builders made votive holders from pinch pots. The lesson is the same for a wheel student until centering and the cylinder are understood. I’m not surprised to be teaching again, its what I do and I’ll always do it in one way or another, I am surprised that it has given the studio and my art life a feeling of life and completion that I was unaware that it lacked. Apparently I am a part of the lives of my students, and they are undoubtedly a deep part of mine. The new class structure and the flexibility of owning the school gives us options for classes that I’ve never considered before. the four week formula will allow us to take on more complex single subjects and really explore them. 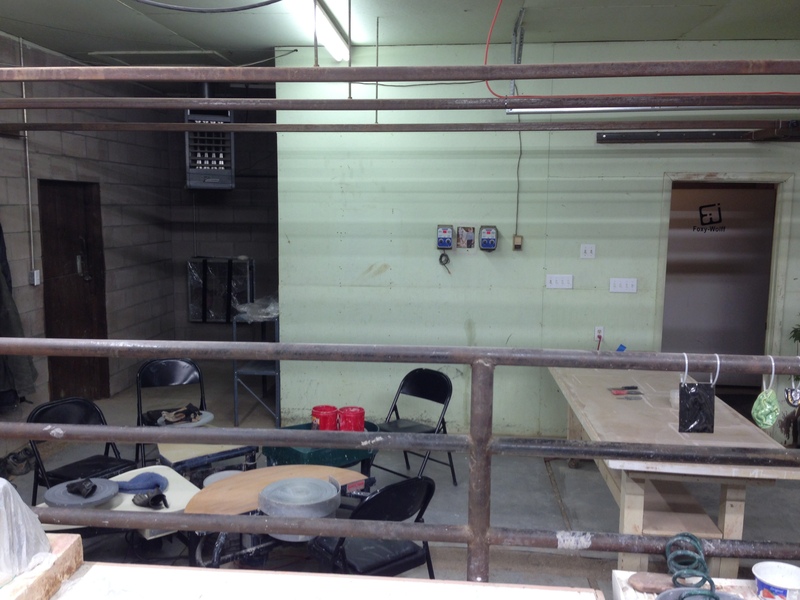 Possible ideas include mold making, clay making and pit firing, and large scale sculpture. Honestly were a bit fired up. One thing is sure, teaching has the potential to be as new and exciting as the rest of our art life, and through teaching we empower other artists to begin their own lifetime of growth and discovery.